We’ve certainly heard a lot about Secretary of the Treasury (and King Arthur: Legend Of The Sword executive producer) Steven Mnuchin since his appointment last year. Other, non-Mnuchin sources have detailed his misuse of public funds, inner turmoil over allowing a heroic abolitionist’s face on American money, and apparent unfamiliarity with what “conflict of interest” means, among so much else. But, until now, we have never, ever heard Mnuchin address the public with his actual voice. 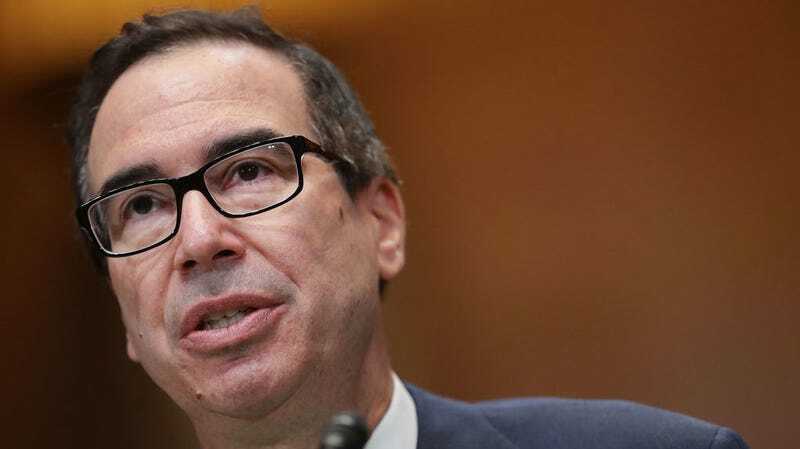 Contrary to popular belief, “Moneyman” Mnuchin has never deigned to share his throat secrets with the public, preferring instead to press a button hidden inside his shirt cuffs that plays an approximation of the human voice when necessary. Luckily for all of us, the truth is finally out, revealed by Twitter user ElElegante101 in a series of clips that have definitely, 100% not been altered in any way. Not every interview is identical. In this discussion with extremely serious newsman Tucker Carlson, Mnuchin displays knowledge of both simple English phrases and, as linguists have already begun decoding, an unconventional method of aural punctuation unknown in any other commonly spoken language. Though it’s easy to be distracted by Mnuchin’s honeyed tones, revealed to the media at long last, it’s important not to forget that the Treasury Secretary’s economic positions are of deep importance as well. For those looking to brush up on Mnuchin’s approach to national finances, it’s worth revisiting a few key points, shown in his responses to questions regarding market trends and tax policy.